Donna Jackson Wright. Age 90. Born November 21, 1927. Passed away April 24, 2018. 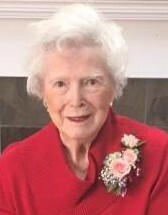 Beloved wife of the late Kenneth F. Wright. Loving mother of Dr. Kenneth C. (Donna) Wright and Nancy Wright (Tom) Schaul. Devoted grandmother of Connor Wright, Dan (Kathy), Nicole and Courtney Schaul. Cherished great-grandmother of Jack, Ava and Kennedy Schaul. Dear sister-in-law of Dorothy Roth, Elizabeth Wright and Adelaide DiBenedetto. Mrs. Wright was a graduate of Maine East High School and Purdue University (1949). She worked as the Business Manager at Proviso West High School. A Memorial Service will be held on Sunday, May 6, 2018, 11:30 a.m., at Westchester Community Church, 1840 Westchester Blvd., Westchester, IL. A private interment will be held in Graceland Cemetery, Chicago. In lieu of flowers, memorial donations to Guide Dogs For The Blind, www.guidedogs.com or Westchester Community Church, are appreciated.